The second German republic is the best Germany ever: liberal, stable, prepared to balance out social differences and with citizens actively engaged in public life. How did this career from the ugly German to moral superpower come about? 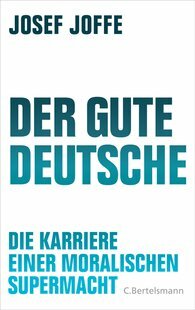 Josef Joffe, renowned journalist and publisher of the weekly Die Zeit, tells the story of this turnabout of the once guilt-ridden pariah that is Germany. From Angela Merkel's mastering the feat of merging moral imperatives with the politically useful; Konrad Adenauer's brilliant strategy of gaining power by renouncing power; Willy Brandt's peace policy as an instrument of consolidating power; and finally Helmut Schmidt's dangerous game in the face of terror and protest. The Germans could be proud of this metamorphosis – notwithstanding its underbelly in the form of mediocracy as mainstream. But they are not.